During the Jurassic period, from around 200 million to 145 million years ago, the Earth’s climate was hotter and there was little or no ice at the poles. Most of the UK was covered in a warm shallow sea teeming with life. Dinosaurs ruled the land, but the ocean was the realm of swimming reptiles, such as plesiosaurs. In 2014, palaeontologists from the Oxford Clay Working Group spotted a small piece of rib at the bottom of a quarry near Peterborough. 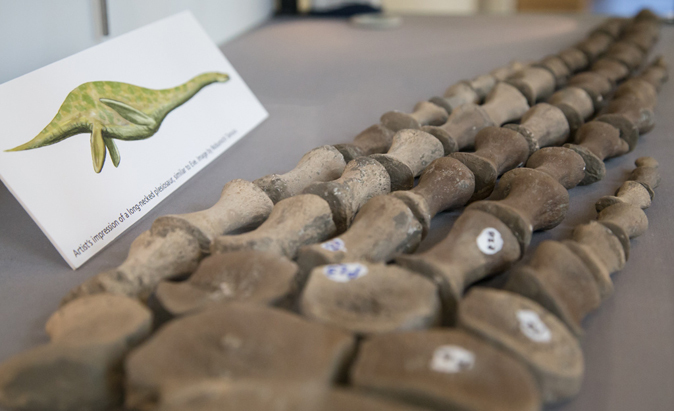 This single bone led to the discovery of a lifetime: a rare, nearly complete, 165-million-year-old plesiosaur skeleton. The palaeontologists nicknamed the 5.5-metre-long reptile ‘Eve’, because it was their first major find. However, we don’t know if it was male or female, and possibly never will. The specimen is now being studied at the Museum, and may prove to be a previously unknown species. Eve was found in a type of rock known as the Oxford Clay. The clay extends in a band across the middle of the country from Dorset in the south, through Oxford and up to North Yorkshire, reaching nearly 185m deep in places. It is well known for its exceptionally preserved fossil reptiles including dinosaurs, ichthyosaurs and thalattosuchians, which are extinct relatives of today’s crocodiles. Eve was kindly donated to the Museum’s collections by quarry owners Forterra in November 2015. Artist’s impression of a long-necked plesiosaur, similar to Eve. Illustration by Nobumichi Tamura. Eve’s left fore-flipper: plesiosaurs had four wing-shaped flippers that they used to ‘fly’ through the water. Their unique swimming style was unlike that of any living animal, and it is not yet fully understood.